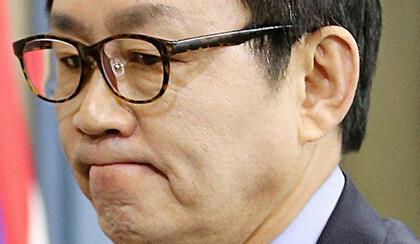 South Korea’s president fired her spokesman Yoon Chang-jung after he was accused of se xually assaulting a 21-year-old intern hired by the Korean Embassy at a Washington, D.C., hotel. Mr. Yoon was part of the entourage for the President’s state visit to the U.S. According to Yonhap News Agency, the district’s Metropolitan Police Department is investigating a charge of misdemeanor se xual abuse. According to the report, Mr. Yoon, aged 56, “grabbed her buttocks without her permission” at a hotel in Washington on Tuesday evening. President Park immediately sacked Mr. Yoon, announcing the move on Thursday at a news briefing in Los Angeles, her final stop of the state visit. The news is leading headlines in South Korean media today with speculation about what really happened. On the evening of the summit, Mr. Yoon apparently drank alcohol with the intern at another hotel lobby close to where he and President Park’s team were staying. South Korean media New Daily reports that Mr. Yoon actually drank with the intern and his driver, and then went for another drink at his hotel room, this time inviting only the intern. He was allegedly wearing “underwear” when she showed up. The intern reported the incident to the police. The next day while President Park was delivering a speech to the Congress, Mr. Yoon abruptly took a taxi to Dulles Airport, bought a business class ticket, and flew back to South Korea. He reportedly left all his belongings at the checked-in hotel.